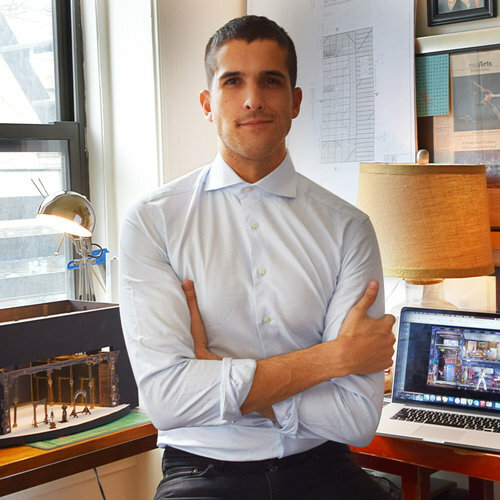 is a New York-based production designer for plays, musicals, opera, fashion, and live events. Upcoming: THE CIRCUS IN WINTER (world premiere, dir: Joe Calarco) at Goodspeed; THE CA LYONS PROJECTS (world premiere, dir: Kent Gash) at the Alliance Theatre; CHOIR BOY (dir: Kent Gash) at Studio Theatre (DC); JASPER IN DEADLAND (dir: Brandon Ivie) at Seattle’s 5th Avenue Theatre; NATIONAL PASTIME and COMPANY (dir: Hunter Foster) at Bucks County Playhouse; SILENCE! The Musical (dir: Alan Paul) at Studio Theatre (DC); 4000 MILES (dir: Alexander Greenfield) at the Aurora Theatre. Associate design: LIVING ON LOVE (dir: Kathleen Marshall) on Broadway. Recent: the Drama Desk Award-winning world premiere production of THE MYSTERIES at the Flea Theare, written by 48 playwrights, directed by Ed Sylvanus Iskandar. Recent theatre: Paradise Factory, Flea Theatre, Two River Theater, Alliance Theatre, Serenbe Playhouse, Yale Dramat, Civic Theatre. Design work for fashion and events includes runway shows in the tents at Mercedes-Benz Fashion Week for Monique Lhuillierwith designer Andrew Ondrejcak, large-scale build-outs for Details Magazine at Lincoln Center and Cedar Lake Dance Center, and the 20th Anniversary Gala event at the Two River Theatre. Associate/assistant design work includes plays and musicals for Broadway, Second Stage, Signature Theatre (NY), the Public, the New Group, Two River Theater, Denver Theatre Center, the Alliance Theatre, the Alley Theatre, South Coast Rep, Syracuse Stage, Cleveland Playhouse, American Repertory Theatre, and NBC television, among others. Jason graduated with honors from New York University.